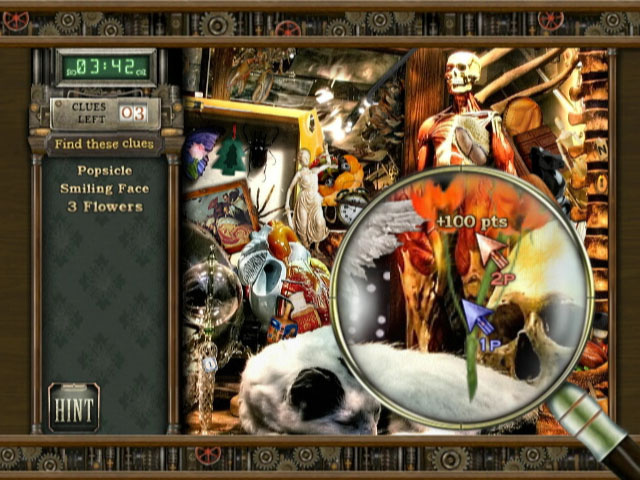 While adventure games are becoming more and more popular over recent years, there has been a new entrance to the arena: the Hidden Object Game. This new breed has inundated the PC with numerous variations on the theme, taking place in fairgrounds, lost temples, mysterious locations and even haunted houses, and naturally they all vary in quality. It was only a matter of time before these games would filter across to consoles, and while several average efforts have featured on the Nintendo DS (why hello, Mystery Stories and Millionheir), this outing from Cate West is actually worth consideration. 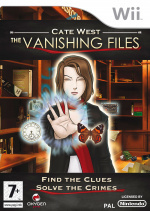 Cate West is a mystery novelist who has been experiencing dreams about her past and visions of the future. Upon an encounter at one of her book signings, she is recruited by police detective Ben Shepherd to help solve a series of murders and robberies under the 'Vanishing Files', nicknamed due to their previously unsolvable nature. 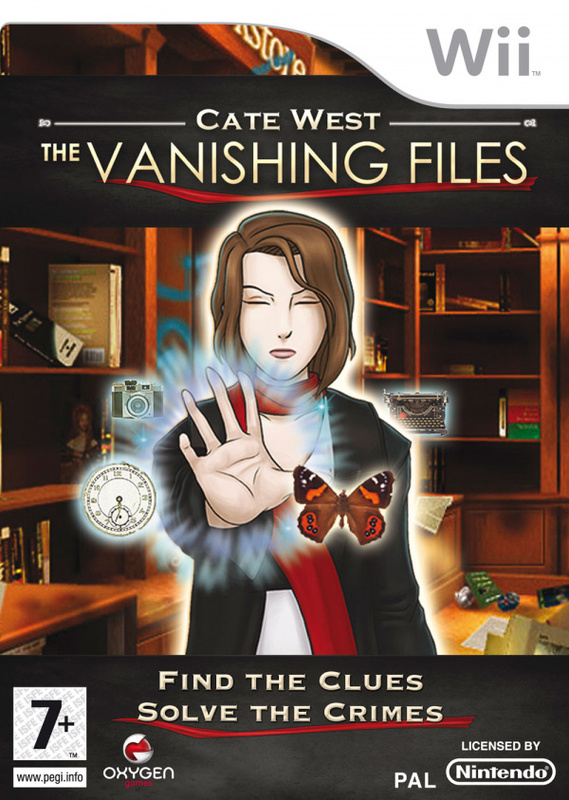 As each crime is solved, the mastermind behind them leaves a series of clues that links to further mysteries as well as proving to be connected with Cate West's past. It's a simple storyline that is slowly revealed as the game progresses and adds incentive to keep playing. 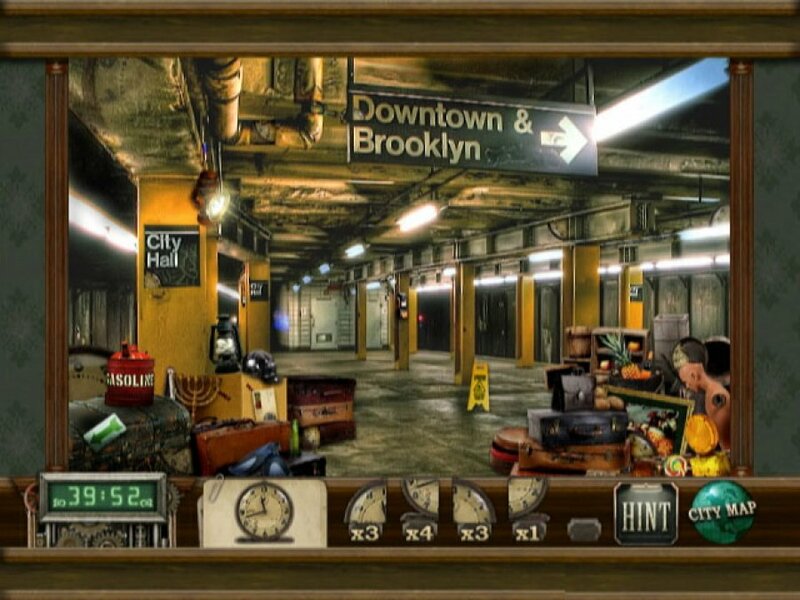 For those who have never played a hidden object game before, they are quite simple to play. A list of objects is written on the side of the screen which need to found within the picture under a specific time limit; at first glance, these scenes are quite ordinary - a picture of a forest, shop or even a computer room - but closer examination reveals hundreds of different objects, from the everyday to the ridiculous, scattered around. You'll find numbers, food items, coins, weapons, animals, technology, musical instruments – if it exists in the world, it's probably featured in one of these somewhere in the background. In the context of Cate West, each scene takes place in a variety of locations, from people's houses, streets, exteriors of shops, banks and libraries, with one thing in common: they are all crime scenes. Regardless of the location, the graphics are bright and colourful and nicely detailed, not suffering from any drop in resolution. The presentation on the whole has a nice polish to it that gives it a feel of quality rather than a rushed port. Cut scenes taking place between each character also have a nice simple, clean feel and while they are not very sophisticated or pushing the Wii to its limits, they are colourful enough to remain interesting. Curiously, the voice acting is limited to key words here and there, usually in greetings, expressions of emotion and people's names. It's a little strange at first, especially when you're accustomed to either full voice acting or none at all, but you do get used to it. In the case of Cate West, the Wii Remote moves the cursor around the screen while the button confirms your selection. The button activates the magnifying glass which you will use for the bulk of the game to look at the scenes in closer detail (and it makes the lists of items far easier to read) and buttons and will toggle a flashlight for those few occasions when there is a power cut. Later scenes will also require you to shake the Remote from side to side to clear the scene of dust or flies in order to see more clearly. The controls are easy to use and actually feel more instinctive than that of a mouse. Selecting an item that doesn't match the list will invoke a penalty where some time will be deducted from your total, and should you get stuck, a hint option is available that highlights an area where an object is hidden, although your score at the end of the chapter will be reduced. 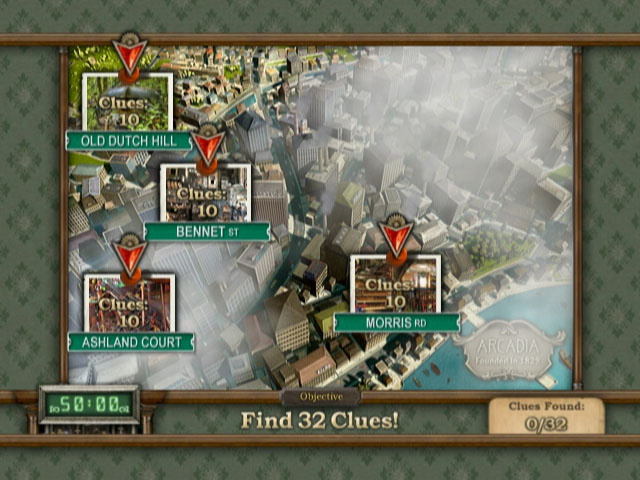 The game is quite lenient towards mistakes without being too harsh on the player, although there are several endings available that are affected by your overall score. As this type of game goes, it's surprisingly enjoyable, offering more in the way of brain power than others on the market. Rather than just restrict the game to a series of screens where you must locate a number of listed items within the time limit, each chapter is divided into five parts. After the first part, Cate will have a vision which reveals two items that need to be found that are split into multiple parts. Part three features pictures of two scenes with subtle differences between them that need to be highlighted: essentially it's a spot the difference mode, but one that can prove to be challenging. 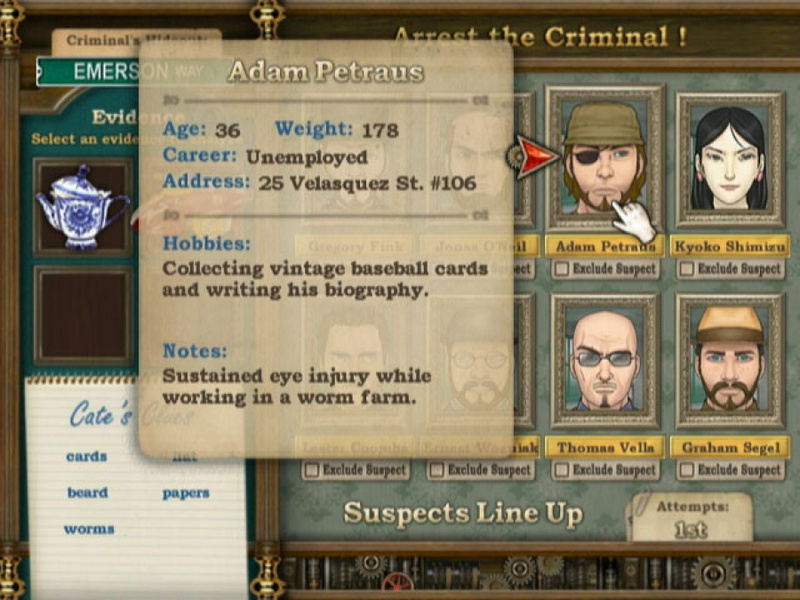 The fourth section involves a little more brain work, where a selection of suspects are revealed and you have to match the right one with the clues given to you. This is often trickier than it looks as several suspects can fit the category, but once again the more lenient approach of the game means you can keep guessing until you get it right, with penalties just in the end of chapter score. Finally, the final part sees you putting back the objects you took out at the beginning of the chapter into the scene to recreate it for the courtroom. The nice thing about the game is that it does get more difficult in later details by not only introducing more objects to find but some of them being craftily hidden - don't be surprised to find something subtly painted into the wallpaper that turns out to be an item on the list. This variety helps to keep the otherwise static gameplay fresh, yet at the same time it's all a bit predictable. You are essentially carrying out the same actions ad infinitum without any dramatic change, and a less regimented approach would have made the game more compelling. The difficulty with such a game is that it really does strain your eyes - constantly looking for items and differences on screen means that you'll find it difficult to see details properly after a prolonged period of time playing. This isn't a criticism of the game itself, more a general observation on the genre. It's a bit like a chocolate cake: really nice in small doses, but you are going to feel mighty sick if you eat the whole lot in one go. Little and often is the key. Although there are areas where Cate West can be improved, for a hidden object game it's definitely one of the best currently available on the market and works well on the Wii. Its intriguing storyline, overall polished presentation and change of gameplay styles makes it a far more interesting proposition than most hidden object titles and it's all the better for it. With fifteen chapters in total taking up around ten hours in length, it's also a reasonable size for your money. Conventional adventure fans looking for puzzles will be better off with a game like Broken Sword or Another Code, but anyone who has ever enjoyed spot the difference-style puzzles and something a little more light-hearted will find that Cate West offers an enjoyable change of pace. I've heard of these, though I've never played one. Looks interesting. Id say the PC version is better to get since its cheaper. Never heard of this one, thanks Kim, might check it out if the price is right! My wife loves Mystery Case Files on the DS so she'd get a kick out of this. Just as an added note, I have both the Wii version and the DS version and they are exactly the same. I haven't found any variance between the two versions. Oh, and this was released in the USA on March 24, 2009 but it still shows TBA on the sidebar. The Oxygen channel makes games? Well done review, but still not a game I'd get... unless it was between something undesirable. Wait, do we have a pop star working at Nintendo Life now? It's gardening these days don't you know?